Pick up rare rainbow prizes on Treasure Hunter from 12th April at 00:00 game time to 17th April at 23:59 game time. Prizes can be multiplied by up to 7 times, so get opening those brightly coloured chests! While opening the rainbow chests, you can win multiplier tokens, which unlock massive multipliers on your prizes for the rest of the promotion - up to a whopping x7! Look out for rainbow-themed prizes including a cape and necklace. These eye-catching items are sure to make you stand out from the crowd. They're tradeable rares, too, and are sure to be highly sought after. Are there any new prizes ? Or the same ones as last time? 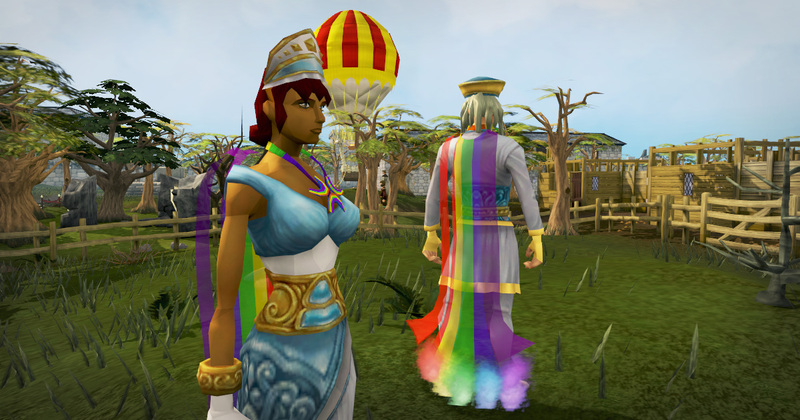 Hopefully I'll get the rainbow cape this time, last time had to buy rainbow necklace from ge, Cape was to expensive. TH rares are always going to be cheaper to buy directly from other players than with keys. Don't waste your money on keys if you only want the rares, buy bonds instead -> sell them for gp -> buy the rares with gp. 1: This is a re-release, so they're not tradeable rares, they're just items you're dripfeeding. 2: Are all promos just going to be Wednesday to Monday now? Literally not a single day without an active promo over two weeks. Don't think that isn't going to be noticed. I'd say "it's getting ridiculous", but let's face it, it's been ridiculous for years now. Yknow, considering that the GE bugged out and stopped these things from appearing for a week? We should have expected this. Also, I'm in agreement with the two posts above. They're not rares. Stop calling them that. And yeah, honestly, I wish I could be angrier about the fact that Wednesday has been defiled too, but I just can't bring myself to care anymore. We all knew it was going to happen.